‘Tis the season to take advantage of all the holiday events in the Mile High. From old school traditions like the Parade of Lights (fair warning: it’s always frigid for that one) to new favorites like the holiday edition of the Denver Flea (it runs for four straight weekends this year! ), there are plenty of ways to celebrate the season. So soak in the extravagant light displays, rock your best ugly Christmas sweater, and drink copious amounts of wassail. It is the most wonderful time of the year, after all. Every year this market named for the traditional fairy-like German Christmas gift-bringer is a destination for those looking to get some holiday shopping don1150362.jpge early... with a healthy side of bratwurst eating. You’ll also find live entertainment and refreshments like schnapps and Glühwein. This annual favorite is all about celebrating wassail, a warm apple cider drink. Over 60 businesses in Frisco will serve up thousands of complimentary cups of the beverage of honor and you can support your favorite version with a vote. The festival also features a breakfast with Santa, free sleigh rides, a tree lighting, the Soup Cup Classic cook-off, and more. Taking a lap around the ice rink is a required activity to rein in the holiday… as is falling over almost immediately. So get ready to pull out that leotard (OK, that's not actually required) and show off your spinning skills. Three festive favorites are coming to the stage this holiday season. The classic A Christmas Carol (November 21-December 24), Irving Berlin’s musical White Christmas (December 5-December 15), and David Sedaris’ tales from a cynical elf in The Santaland Diaries (November 23-December 24). Miracle, the decked out Christmas bar that's popping up all around the country, returns to Denver this year in a new location. Jam-packed with holiday decor (and cheer!) this is your go-to option for a dose of tinsel-covered fun this holiday season. Be sure to purchase a holiday mug while you're enjoying festive cocktails - 10% of the sales will be donated to Action Against Hunger. With hundreds of local makers, this is your best bet for finding that unique gift that’s just right for all the special people in your life (and your annoying co-worker Tevin who you drew for Secret Santa). This year, the flea’s going big with four weekends of shopping time so you’ve got no excuses for missing out. Take a nighttime stroll and explore the light displays that illuminate this Denver landmark during the holidays. This year’s event promises more lights than ever with an interactive field filled with sound-reactive, animated LED lights, and a few new surprise features. Carolers will also be providing some holiday tunes on select nights. For the 58th year, this classic holiday tale comes to life with live music accompaniment from the Colorado Ballet Orchestra. Get dressed up and treat yourself to a classy night out, ‘cause the holidays are all about treating yourself as well as others. Marching bands, illuminated floats, and the big bearded guy himself will all be making their way through Downtown for this annual tradition. Bring a thermos full of hot cocoa (or whatever beverage you prefer to keep warm with) and take in the sights as they pass by. Take a trip back in time at this fest that features old-school holiday traditions. After your horse and wagon ride, browse the holiday market, listen to carolers, visit stores participating in the local merchant open house, get a photo op with Olde World Santa, and pick up your tree from the outdoor lot. This party goes all out when it comes to the 1940s/1950s theme, so this is the time for YOU to go all out with your best retro ensemble for a night of dancing to big band music complete with a Rat Pack tribute. There will also be plenty of sparkling lights, antique cars, and tributes to classic films including a recreation of The Columbia Inn and Novello’s Nightclub from White Christmas and a Bedford Falls High School Charleston Dance-off. Lions and tigers and sparkling light displays, oh my! The zoo transforms every year for this popular event where light sculptures come to life right alongside the real live animals. Grab a cup of cocoa and spend an evening exploring the zoo in a whole new light (literally). 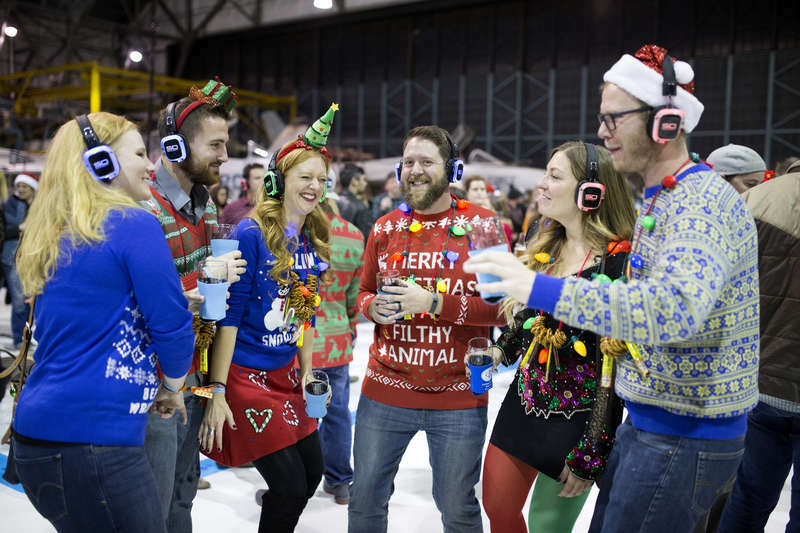 This beer festival embraces holiday cheer while highlighting Denver (only) breweries. Sip the selections, enjoy some music, and look out for some ‘90s references in honor of Festivus’ rise to fame on Seinfeld. With two shows, one at 9pm for a family-friendly viewing, and one when the clock strikes midnight, this Denver tradition is a New Year’s Eve can’t-miss. The fireworks can be viewed from many vantage points Downtown but your best bet is to gather along the 16th Street Mall.